Walk to Beach, Promenade or Main St! We have priced this unit below market, please do not ask for a discount. We will only rent to credit worthy renters with adequate income. 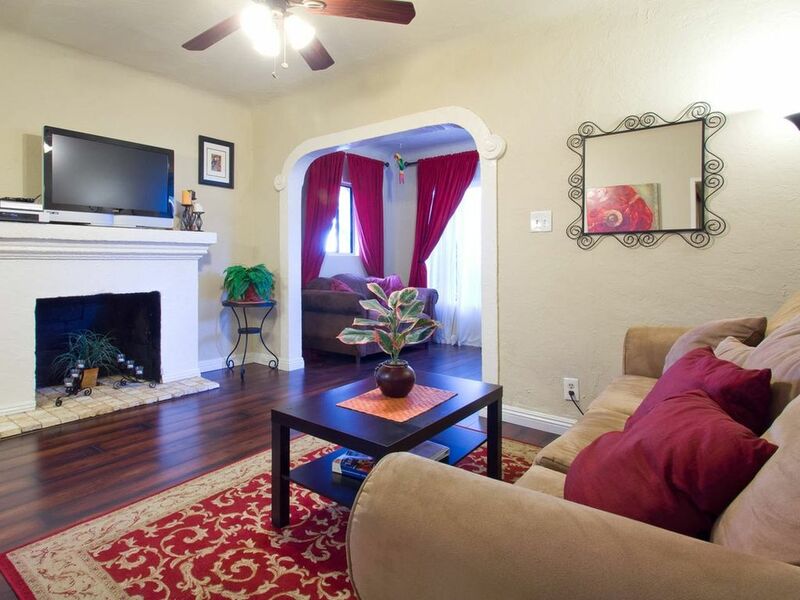 This charming Spanish style 2+1 unit with old world charm in 4 plex has hardwood floors, original artwork, fireplace, architectural archways, and a lovely porch & garden front yard. A queen bed with memory foam pillows in master, 2 twin beds in 2nd bedroom, and a queen sofa sleeper in living room will sleep up to 6 people. Convenient location - Walk to Beach, Promenade or Main St! * Parking with permit for up to 2 cars for street. *Air conditioning is not needed here, it's almost perfect weather year round, and sea breezes keep it cool. *There is a wall furnace for any rare crisp winter nights. .8 mile to closest beach at end of Pico. Or take Colorado Blvd .9 miles, 10-15 walk to the famous Santa Monica Pier, home to Pacific Park Amusement, and the only a solar powered ferris wheel! Shared extension with other units. Custom cabinets with granite counters, stainless steel appliances. Coin operated laundry room in back. Parking permit is provided so you can park for free on the street. The driveway may be rented for $10 a night or $50 a week. I stayed here for a month while I did research at film archives, and it worked perfectly for me and my family. The location was ideal: I was able to catch the metro (10 minute walk to the Expo Line stop) to go to some archives, and had an easy drive to the others. Furthermore, my partner and daughter (neither of whom drives) were able to walk down to the beach and/or the 3rd Street Promenade (both 15-20 minutes away) every day. And the whole Santa Monica/Ocean Park/Venice area is great. The home itself is small but cozy and well taken care of. The three of us felt very comfortable there. Even though we were there during a heat wave, the ceiling fans worked really well to cool the place down and we never had trouble sleeping or anything. The laundry machines are easy to use and effective, too. Finally, Kathryn responded to our concerns right away--the wifi went out one day, and she responded to our texts within an hour or two, and rectified the matter as quickly. And when we had one or two other questions during our stay, she responded promptly and helpfully. In short, we would stay here again in a heartbeat. I was there for my business. But some years ago, I came for holidays. Each time, it has been a good place to be, very quiet, very close of the beaches or Santa Monica centre. If you are a family with 2 children or 2 teenagers, it will be perfect. Spent a week here. It had everything we needed and was close enough to everything if you have a car. I enjoyed runs to the beach and up to Venice. We entirely enjoyed our stay and it was very clean. We spent a week of 2015 Spring break here with kids and grandma. We loved a fully equipped kitchen to make good breakfasts and dinners for the whole family. Very clean condo, short walk to the beaches. We really enjoyed our week stay at the casita. It had everything needed for a comfortable stay. Santa Monica is beautiful! This is a convenient location - just head west 9 blocks to beach. Or go about 4 blocks north & 8 blocks west to shop or stroll the famous Third Street Promenade, continue west another 3 blocks to Pacific Park amusements on the Pier and beach. Or walk to Main St for the Farmers Market on Sunday mornings. About 1.5 miles north, drive up to chic Montana Ave with it's trendy Boutiques. Going south 1.5 miles takes you to the heart of funky Venice Beach boardwalk with it's street performers, vendors & famous Muscle Beach. So much to see & do here in Santa Monica!! We generally require a week min unless spare days between booking or last minute. We will email the rental agreement upon confirmed reservation. NO SMOKING; NO PETS; NO PARTIES Cancellation Policy: Refund less fees up until 30 days prior to arrival. Fees may include credit card fees / PayPal fees / Homeaway / VBRO fees depending upon how and where you booked your reservation. Since this is not a hotel & I don't have other rooms to take the place of a vacancy, it's a hardship for me if someone cancels at the last minute.